As I’ve been playing decades’ worth of wrestling games, I feel it’s important to stop and ask: How did it all begin? 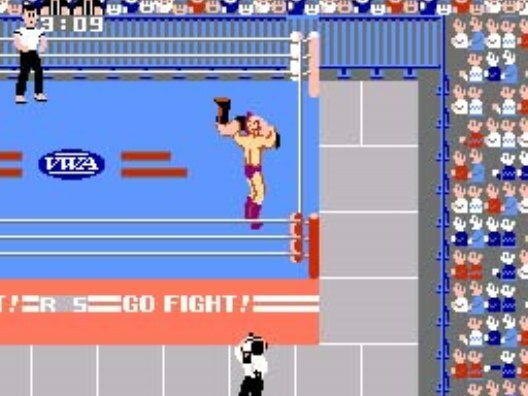 When did game developers first conclude that professional wrestling could work in video game form? How did they find out that they could make a successful game off of this subject matter? Well, the answer lies in this old school game right here. At a time when Nintendo had come to America and brought us the first outings for our favorite classic game series like Mario, Zelda, and Castlevania, they also branched out to sports games. One of them was their first crack at the wonderful world of wrestling. Simply entitled, Pro Wrestling (and, in its native Japan, Puroresu), this unlicensed wrestling title would take a small cast of fictional wrestlers and allow players to control them in a straightforward in-ring experience that captures the fundamentals of pro wrestling. Pro Wrestling was not actually the first wrestling game to be released on the NES; that honor (?) belongs to Tag Team Wrestling, but…yeah, that game was embarrassing. No, the first real, substantial and engaging wrestling game was this one. How did Nintendo approach it? How does it hold up today? Let’s take a look. Who, in this Japanese-made game, is a Korean depicted as a stereotypical yellow-skinned, slant-eyed, old martial arts master! Hoooooo boy! Before I get distracted and launch into an in-depth analysis of the unpleasant East Asian sociology this represents, let’s move on. Next up is Giant Panther, the big blonde American power wrestler. The Amazon, a vicious, dirty-fighting monster. And finally, King Slender, a Ric Flair-esque technical wrestler with long blonde hair. Once you choose which wrestler to play as, the game wastes no time in hitting the ring as you start your quest to the top. The game features some really ingenious small details when it comes to presentation. You have the wrestling ring, animated fans and commentators in the crowd, and an honest-to-god referee in the ring who follows the action and counts the pinfalls. There’s even a cameraman at the bottom of the screen! Each wrestler has a combination of strike moves and common grapple moves, such as bodyslams and suplexes. It’s even possible to do a running over the top rope dive to the outside of the ring when your opponent is lying prone on the outside. Furthermore, each character has unique signature moves which give them an edge over their opponents. Fighter Hayabusa has an enziguri-like brain kick which is difficult to execute, but very devastating when you manage to hit it. King Slender has a backbreaker, The Amazon bites and chokes, and more. It’s a decent move set for such an early wrestling game, and playing as the different wrestlers manages to be a distinct experience. Matches do require a bit of strategy. You need to start off small and soften your opponent up with basic moves, before you can move on to devastating moves like brainbusters or piledrivers. Otherwise, you could be on the receiving end of a devastating reversal that could put you at a disadvantage. It actually comes across like a prototypical version of the Fire Pro Wrestling series’ approach to putting on matches; you can’t dish out the flashy moves at the very start, or you’ll get reversed immediately and see the momentum swinging in your opponent’s favor. Fortunately, most wrestler’s signature moves aren’t restricted in this way, so you can strategically use them to gain the upper hand. However, because each wrestler has their own unique weapons in their wrestling arsenal, you may need to tailor your matches, deciding which ones are safer to try overpowering in grapples, and which ones you need to keep your distance from and take down gradually with strikes. You’ll even need to watch your ring positioning: That referee I mentioned earlier? He literally needs to count the pinfalls, and if you try to pin your opponent when the ref is on the other side of the ring, the milliseconds it takes for him to get over to you and count may give your opponent just enough recovery time to kick out. If I could describe playing and beating the game, I would say that it’s easy to learn, but difficult to master. 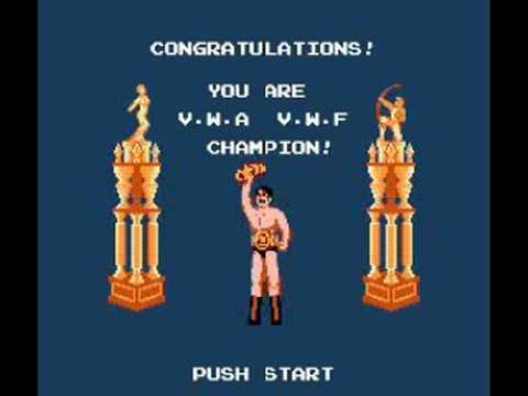 The single-player mode sees your wrestler defeat all five other opponents in order to become the Video Wrestling Association (VWA) Champion. Once you win the title, though, the challenge is only just getting started; you must then string up 10 consecutive successful title defenses in order to prove yourself as the dominant superstar of the VWA. This is much easier said than done; the game keeps you on your toes with little time to stop and take a break, and while landing victories is fairly doable initially, maintaining that strong winning streak is considerably more difficult. And if your opponent manages to pin you for the title, you have to win back the belt and begin the streak of 10 title defenses all over again. This game truly was made in the early NES period of games, when games did nothing to hold your hand and make things easy, and games like Castlevania, Contra, or Ninja Gaiden presented players with a ruthless challenge. You have to become an absolute master at this game in order to maintain your run of success, and by the time you do succeed in racking up all the consecutive wins, you’ll be living, breathing, and dreaming NES Pro Wrestling. And hey, I almost forgot to mention; once you get 10 straight title defenses, it STILL isn’t over. Once you’ve proven yourself in the VWA, it’s time for a title unification match against the game’s final boss: Great Puma, Champion of the Video Wrestling Federation (VWF), who packs a ridiculous arsenal of diverse, powerful moves in order to present you with your hardest opponent yet. Finishing this game is an arduous, merciless, hair-pullingly frustrating process, but once you finally do lay Great Puma down for the three count and become the unified champion, you can celebrate for weeks on end over your incredible accomplishment. Pro Wrestling for the NES. It can be frustrating, difficult, and time consuming. But it is also atmospheric, innovative, surprisingly sophisticated, accessible, straightforward, and engaging. Nintendo truly deserves credit for what they accomplished with this game; video games were still young, and wrestling games were unexplored territory, so game makers had to start from scratch to make the subject matter into something decent. And yet, with this game, Nintendo demonstrates a great understanding of the fundamentals of professional wrestling, and makes a very appealing experience that presents a tough but (mostly) fair challenge, and creates a lot of substance to have a fun in-ring experience. The game is a classic, and it paved the way for all the games that came after it, making it truly one of the most important wrestling games ever made, and still fun to pick up decades later. Kudos to you, Nintendo; let it be known now and forever that, when it comes to making a fun wrestling game, A Winner truly Is You.